New data from Biogen Inc.’s early-stage study of Alzheimer’s patients showed that an experimental drug slowed the mental decline of patients with early indications and mild cases of the disease. Clinical data released Wednesday contained encouraging findings — but also reasons for caution — on a pair of experimental drugs to treat Alzheimer’s disease, an affliction robbing tens of millions of people worldwide of their memory and cognition. One drug, from Cambridge biotech company Biogen Inc., continued to show evidence of slowing the mental decline of patients with early indications and mild cases of the progressive disease. But it also caused a side effect when given at the doses that were most effective. The other drug, being developed by Eli Lilly and Co., also appeared to reduce deterioration of brain functions of patients with mild Alzheimer’s symptoms, based on a new analysis. Two previous studies, published by Lilly in 2012, failed to show the compound acted effectively against proteins that can cause a buildup of plaque in the brain. Both drug candidates will require more clinical study before they can be submitted for regulatory approval. But the reports, presented at the Alzheimer’s Association International Conference in Washington, D.C., generated excitement among patients, their families and neurologists. Alzheimer’s, which has proven to be stubbornly resistant to treatments, affects more than 25 million people globally, according to the World Health Organization. Biogen, Lilly, and Swiss drug giant Roche AG have drugs under development, though it’s too soon to say if any will be able to demonstrate the medical benefit required for approval. Thus far, no drug compound has been found to stabilize patients or reverse the progression of the disease. The findings from both studies bolstered the long-held “amyloid hypothesis” of neurologists who believe plaque deposits in the brain are a precursor to Alzheimer’s. But the experimental drugs from Biogen and Indianapolis-based Lilly act in different ways. Lilly’s compound binds to floating amyloid beta proteins that can form plaque in the brain, while Biogen’s candidate binds directly to the plaque. The study results “suggest that the field is moving in the right direction,” said Dr. Ronald C. Petersen, director of the Mayo Clinic Alzheimer’s Disease Research Center, a national leader who treated the late President Reagan and has been treating country music singer Glen Campbell. Investors seemed to embrace similar sentiments. Shares of Biogen tumbled $17.76 to $391.74, losing 4.3 percent Wednesday. Lilly’s shares climbed 81 cents to $86.38, a gain of 0.9 percent. Analysts said the clinical findings revived hope that Lilly’s drug candidate might be viable after disappointing investors three years ago. Biogen, by contrast, had seen its shares rise more than 25 percent since December on the promise of its experimental drug. While the fresh data Wednesday largely confirmed that promise, investors seemed to focus on some caveats. 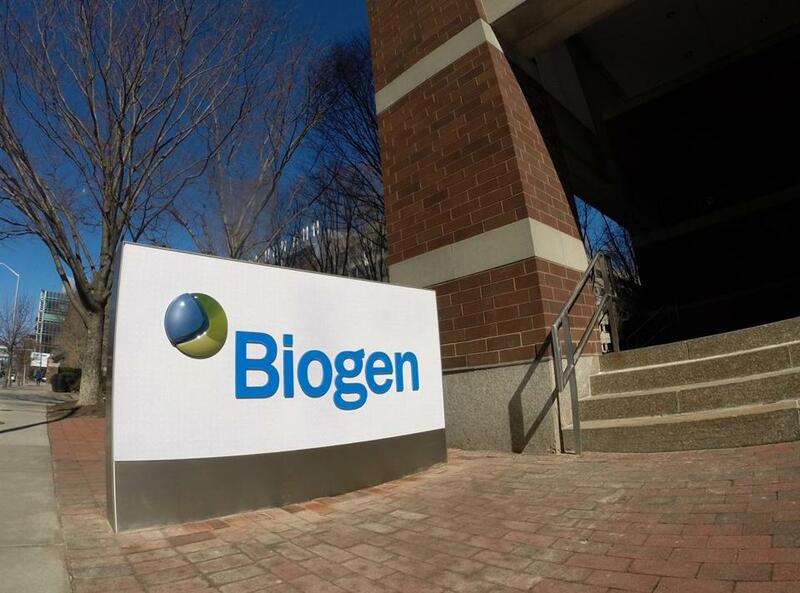 Biogen’s new data, involving just 166 patients in the United States, was strong enough for the company to move forward with screening of patients for a late-stage trial, said Jeff Sevigny, the company’s senior medical director for clinical development. Sevigny said patients given higher doses of the drug candidate generally showed slower deterioration than those given lower doses. But a medium dose of the Biogen drug didn’t reduce cognitive decline by some measures as much as a lower dose, leading some stock analysts to express caution on the findings. Sevigny said the company’s latest findings regarding side effects were “consistent with the previous report.” Some patients taking the Biogen drug experienced a side effect involving fluid leaked from the blood vessels in the brain, though the leakage typically didn’t cause symptoms, he said. Lilly’s data came from a larger and later-stage study of its Alzheimer’s drug candidate. In its so-called delayed start analysis, a follow-up to a pair of previous studies, patients taking the drug after first taking a placebo for 18 months were shown two years later to have lost more brain cells than those taking the drug during the entire time. Those results, like Biogen’s, still must be confirmed in another late-stage study before the programs can move forward, said Lilly senior medical director Eric Siemers. Correction: An earlier version of this story misspelled the name of Dr. Ronald C. Petersen.